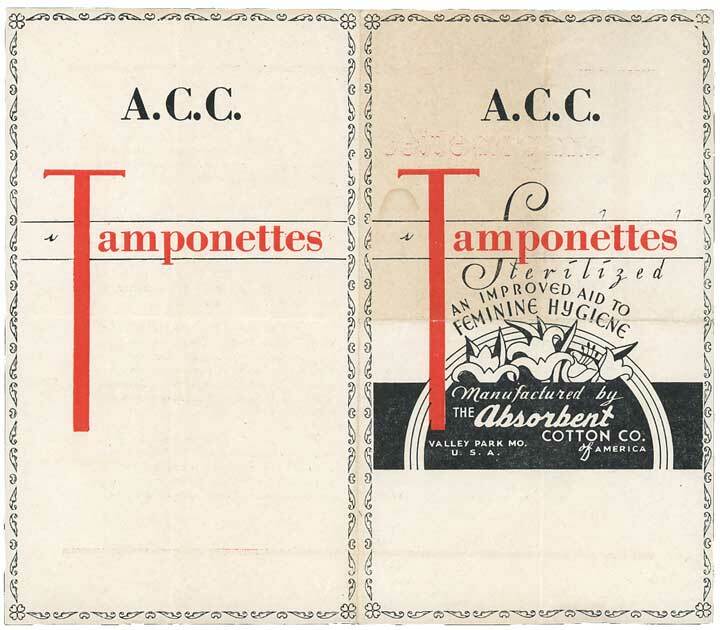 See Kotex's first successful tampon, Fibs; early Kotex tampon attempts; and an early Tampax. The explanatory leaflet in the packaging, below, mentions that tampons "have been in use in European countries for over thirty years." To the best of my knowledge these were not commercial tampons but homemade. Dr. Robert Dickinson mentions many American women making their own tampons in 1942. 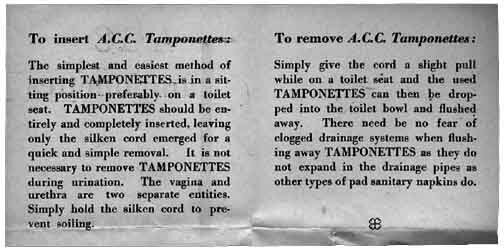 A friend told me that a well-known German man she once worked for in America told her that his mother had made her own tampons, sewing them at home, in late 19th-century or early 20th-century Germany. Americans I believe introduced commercial tampons to Europe, and before World War II (Tampax; see three 1938 Dutch ads), the first indigenous brand being (I think) the German o.b. ("ohne Binde," "without a pad" - see a German folder from the early 1950s). Tambrands gave this museum a box of Tampax in French and dated the box to the late 1930s. The text (below) also says, "In the theatrical profession tampons have long been a necessity but have been mostly of home-made construction . . . ." Compare this to what the authors of Zur Geschichte der Unterwäsche 1700-1960 (discussion) write about early menstrual protection in Germany, that virtually only those in the theater used such protection before roughly 1900 (they mention close-fitting pads and sponges, but not tampons). "[M]ostly of home-made construction" might indicate that the only other tampons were medical ones that doctors used. Or were there commercial ones before the earliest American ones from the 1930s (see some the museum has)? SEE ALSO the directory of all tampons on this site. Below: The opened introductory leaflet (it folds in half heightwise) measures 7 1/8 x 6 1/4" (18.1 x 15.9 cm). Fear of blocking the menstrual flow is an old concern and probably stopped many women from trying tampons. the theater use tampons? This leaflet is from the older box but seems identical to that of the 1939 one. ahead of many current products. 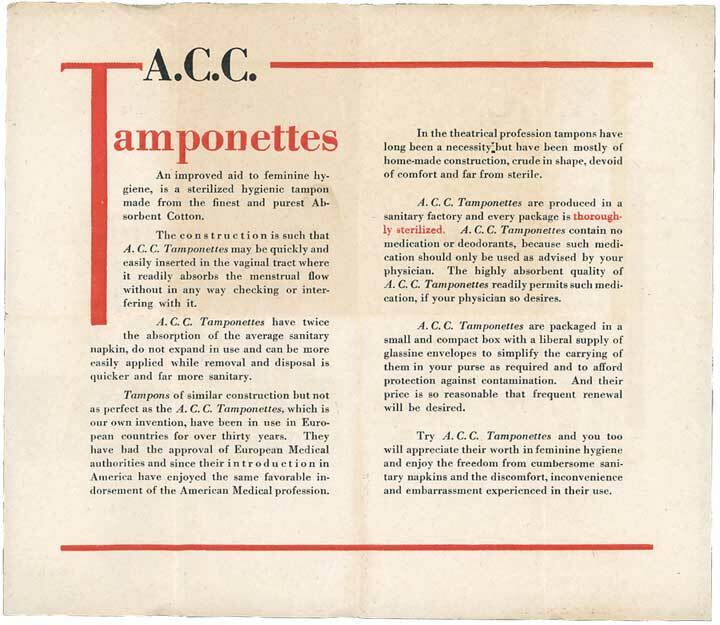 Read a slightly later (1945) comparison between tampons and pads, which favored tampons. (à la Chrysler Building) at right shows the menstrual flowers often associated with menstrual products. industrial arts held in Paris, France, in 1925 [emphasis added]." The last and first pages of the instructions (3.25 x 7" [16.5 x 8.2 cm) opened), which show the red, a color seldom found today on menstrual packaging, and much more often on these early boxes. The cord may be silken, but it looks like cotton to me; this might be an attempt to dignify the topic. In spite of the assurance, tampons and pads clogged drains everywhere. Read the comments and anecdotes in Dr. Lillian Gilbreth's Johnson & Johnson report (1927). END (box, tampon) See Kotex's first successful tampon, Fibs; early Kotex tampon attempts; and an early Tampax.